Alfred Louis Kroeber (June 11, 1876 – October 5, 1960) was an American cultural anthropologist. He received his Ph.D. under Franz Boas at Columbia University in 1901, the first doctorate in anthropology awarded by Columbia. He was also the first professor appointed to the Department of Anthropology at the University of California, Berkeley. He played an integral role in the early days of its Museum of Anthropology, where he served as director from 1909 through 1947. 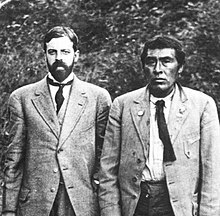 Kroeber provided detailed information about Ishi, the last surviving member of the Yahi people, whom he studied over a period of years. He was the father of the acclaimed novelist, poet, and writer of short stories Ursula K. Le Guin. Kroeber was born in Hoboken, New Jersey, to upper middle-class parents: Florence Kroeber, who immigrated at the age of 10 to the United States with his parents and family from Germany, and Johanna Muller, who was of German descent. His family moved into New York when Alfred was quite young, and he was tutored and attended private schools there. He had three younger siblings and all had scholarly interests. The family was bilingual, speaking German at home, and Kroeber also began to study Latin and Greek in school, beginning a lifelong interest in languages. He attended Columbia College at the age of 16, joining the Philolexian Society and earning an A.B. in English in 1896 and an M.A. in Romantic drama in 1897. Changing fields to the new one of anthropology, he received his Ph.D. under Franz Boas at Columbia University in 1901, basing his 28-page dissertation on decorative symbolism on his field work among the Arapaho. It was the first doctorate in anthropology awarded by Columbia. Kroeber spent most of his career in California, primarily at the University of California, Berkeley. He was both a Professor of Anthropology and the Director of what was then the University of California Museum of Anthropology (now the Phoebe A. Hearst Museum of Anthropology). The anthropology department's headquarters building at the University of California is named Kroeber Hall in his honor. He was associated with Berkeley until his retirement in 1946. Kroeber married Henrietta Rothschild in 1906. She contracted tuberculosis (TB) and died in 1913, after several years of illness. In 1926 he married again, to Theodora Kracaw Brown, a widow whom he met as a student in one of his graduate seminars. They had two children: Karl Kroeber, a literary critic, and the science fiction writer Ursula Kroeber Le Guin. In addition, Alfred adopted Theodora's sons by her first marriage, Ted and Clifton Brown, who both took his surname. In 2003, Clifton and Karl Kroeber published a book of essays on Ishi's story, which they co-edited, called, Ishi in Three Centuries. This is the first scholarly book on Ishi to contain essays by Native American writers and academics. Alfred Kroeber died in Paris on October 5, 1960. Although he is known primarily as a cultural anthropologist, he did significant work in archaeology and anthropological linguistics, and he contributed to anthropology by making connections between archaeology and culture. He conducted excavations in New Mexico, Mexico, and Peru. In Peru he helped found the Institute for Andean Studies (IAS) with the Peruvian anthropologist Julio C. Tello and other major scholars. Kroeber and his students did important work collecting cultural data on western tribes of Native Americans. The work done in preserving information about California tribes appeared in Handbook of the Indians of California (1925). In that book, Kroeber first described a pattern in California groups where a social unit was smaller and less hierarchically organized than a tribe, which was elaborated upon in The Patwin and their Neighbors in which Kroeber first coined the term "tribelet" to describe this level of organization. Kroeber is credited with developing the concepts of culture area, cultural configuration (Cultural and Natural Areas of Native North America, 1939), and cultural fatigue (Anthropology, 1963). Kroeber's influence was so strong that many contemporaries adopted his style of beard and mustache as well as his views as a cultural historian. During his lifetime, he was known as the "Dean of American Anthropologists". Kroeber and Roland B. Dixon were very influential in the genetic classification of Native American languages in North America, being responsible for theoretical groupings such as Penutian and Hokan, based on common languages. He is noted for working with Ishi, who was claimed to be the last California Yahi Indian. (Ishi may have been of mixed ethnic heritage, with a father from the Wintu, Maidu or Nomlaki tribes.) His second wife, Theodora Kracaw Kroeber, wrote a well-known biography of Ishi, Ishi in Two Worlds. Kroeber's relationship with Ishi was the subject of a film, The Last of His Tribe (1992), starring Jon Voight as Kroeber and Graham Greene as Ishi. Kroeber's textbook, Anthropology (1923, 1948), was widely used for many years. In the late 1940s, it was one of ten books required as reading for all students during their first year at Columbia University. His book, Configurations of Cultural Growth (1944), had a lasting impact on social scientific research on genius and greatness; Kroeber believed that genius arose out of culture at particular times, rather than holding to "the great man" theory. Kroeber served early on as the plaintiffs' director of research in Indians of California v. the United States, a land claim case. His associate director and the director of research for the federal government in the case had both been students of his: Omer Stewart of the University of Colorado, and Ralph Beals of the University of California, Los Angeles, respectively. Kroeber's impact on the Indian Claims Commission may well have established the way expert witnesses presented testimony before the tribunal. Several of his former students also served as expert witnesses; for instance, Stewart directed the plaintiff research for the Ute and for the Shoshone peoples. He was awarded two gold medals. He held honorary membership in 16 scientific societies. "Indian Myths of South Central California" (1907), in University of California Publications in American Archaeology and Ethnology 4:167-250. Berkeley (Six Rumsien Costanoan myths, pp. 199–202); online at Sacred Texts. The Nature of Culture (1952). Chicago. with Clyde Kluckhohn: Culture. A Critical Review of Concepts and Definitions (1952). Cambridge. Anthropology: Culture Patterns & Processes (1963). New York: Harcourt, Brace & World (earlier editions in 1923 and 1948). ^ "History, Anthropology Department, UC Berkeley". University of California, Berkeley. Archived from the original on 2014-10-09. Retrieved 7 January 2015. ^ Staff. "Dr. Kroeber Dies; Anthropologist; Authority on Indians Taught at California 45 Years—Wrote Standard Text", The New York Times, October 6, 1960. Accessed February 6, 2013. "A native of Hoboken, N. J., Dr. Kroeber was graduated from Columbia in 1896." ^ Kroeber, A (1976). Handbook of the Indians of California. New York: Dover Publications. pp. 160–163, 228–230, 234–235. ISBN 0486233685. ^ Golla, Victor (2011). California Indian languages. Berkeley: University of California Press. ISBN 0520266676. ^ Kroeber, A.L. (1932). The Patwin and their neighbors (PDF). bUniversity of California Press. ^ "ARF Newsletter 1996 v3-2 | Archaeological Research Facility". Arf.berkeley.edu. Retrieved 2013-08-29. ^ Fleras, Augie (2006). "Ishi in Two Worlds: A Biography of the Last Wild Indian in North America". Journal of Multilingual and Multicultural Development. 27 (3): 265–268. doi:10.1080/01434630608668780. ^ Beals, R. L. (1985). "The Anthropologist as Expert Witness: Illustrations from the California Indian Land Claims Case," in Irredeemable America: the Indians' Estate and Land Claims, ed. I. Sutton (Albuquerque: University of New Mexico Press); ch. 6. Heizer, Robert F., and Alfred L. Kroeber (1976). "For Sale: California at 47 Cents per Acre," Journal of California Anthropology 3:38-65. ^ Stewart, Omer C. (1961). "Kroeber and the Indian Claims Commission Cases," Kroeber Anthropological Society Papers, 25: 181-190. ^ Stewart, Omer C. (1985). "The Shoshone Claims Cases," in Irredeemable America..., op. cit., ch. 8. ^ "Book of Members, 1780–2010: Chapter B" (PDF). American Academy of Arts and Sciences. Retrieved June 1, 2011. Darnell, Regna (2001). Invisible Genealogies: A History of Americanist Anthropology. Critical studies in the history of anthropology series, vol. 1. Lincoln: University of Nebraska Press. ISBN 0-8032-1710-2. OCLC 44502297. Kroeber, Theodora (1970). Alfred Kroeber; A Personal Configuration. Berkeley and Los Angeles: University of California Press. ISBN 0-520-03720-0. OCLC 6202748. Wolf, Eric R. (2004). "Alfred L. Kroeber". In Sydel Silverman (ed.). Totems and Teachers: Key Figures in the History of Anthropology (2nd ed.). Walnut Creek, CA: AltaMira Press. pp. 27–50. ISBN 0-7591-0459-X. OCLC 52373442.